I'm not moving. Whew! That's a relief. But I have moved. And I both loved and hated every move. Moving is hard. I moved from my parents' home to a college dorm. I moved again from my parents' home...to a sweet little apartment shared with my new husband...900 miles away from my parents! I moved from that parsonage to another and yet another...once again 900 miles from "home." I moved down the road to our dream home, designed and built with our blood, sweat and tears. And then I moved to the desert...1,800 miles away from my parents' green, lush yard! Each move required hard physical labor. (Well, except for the two moves I managed to experience eight months pregnant so that I didn't have to lug a single box across the room!) But more draining than cleaning and sorting and packing and driving and unloading and unpacking and settling...the emotional stress of moving was always overwhelming. Whether my husband and I were launching a new life in an idyllic little town or we were cramming two disgruntled kids and two frightened dogs into a van so we could venture into the desert, moving was stressful. Change is stressful. Good or bad, positive or negative, moving is stressful. Living in a military town, I'm a little more aware than most that summer months are often marked with moving vans and "for sale" signs and garage sales and school registrations for thousands of families each year. This month our church is saying goodbye to several dear families who are moving away. Meanwhile we'll begin seeing unfamiliar and slightly bewildered faces filling our pews as others move into those emptied homes. 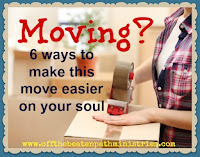 So...because I've been there and I've done that and I'm oh so grateful that I'm not loading or moving around boxes this year...I thought I'd offer a few words of encouragement to those of you who are moving. No, I have no tips for packing your belongings. Quite honestly, my husband did most of the dirty work involved in our moves. Instead, I'll be offering you a little moral support and a few kind words. There are so many possible scenarios for your move. You could be wiping the dust from your feet and getting out of Dodge with a sigh of relief. Or you could be leaving the hometown where you grew up and thought you'd always be. You could be making just one more in a series of moves or you could be making the move of a lifetime. Goodbyes will be different depending on your situation. Regardless of the situation, you have to say goodbye. That's right. Even if you're as happy about leaving and moving on as a rabbit loosed from a trap, you need some closure. Please say goodbye. Believe it or not, and I know some of you don't, there are people who will miss you. Even if you never got to know them well, someone will notice that you have left...and they'll wonder why you didn't say goodbye. A couple of weeks ago, a young couple pulled me aside after church to tell me that was their last Sunday with us. What?! Like many military families in our church, we had barely met them before it was time for them to leave. Unfortunately my husband wasn't in the pulpit that week because he was home recuperating from surgery. They were sad to miss him, but asked me to tell him how much they had enjoyed his preaching and the fellowship of our church. The young couple with the precious little girl didn't have to do that. They didn't have to say goodbye. They could have just slipped out quietly, assuming, as many military families do, that no one will miss them. But they would have been wrong. I'll miss them. I imagine others will, too. I'm glad they said goodbye. Their farewell and parting words honored me. Their "goodbye" acknowledged that I had said "hello" and welcomed them into my world (even if just for a few months). And instead of just slipping out and moving on, their simple acknowledgement gave me the opportunity to look them in the eyes one last time and honor them with my own simple words: "We hate to see you go." Because we really do. Hate to see you go, that is. You may be the one moving, and you may assume moving is hard only on you. But your leaving affects those of us staying behind, too. It's hard for us to say goodbye, as well. Goodbyes are difficult all around. Maybe you live in a rural farming community where you haven't seen a moving van in years. But I live in a military town where people are as transient as migrating whales. Still, regardless of how quickly people move in and out...we're people. We're not whales. People say "hello" and "goodbye" and "take care." People take a moment. People pause long enough to shake a hand or hug a neck or exchange email addresses. Don't assume people know you're moving. They don't. In this Facebook and Instagram age, we sometimes assume everyone knows the goings and comings of our lives. They don't. Tell people where you're going and why and when. In fact, say things like, "Next week will be my final week at Bible study" or "We just have two more weeks to attend church here" or "Our families need to go get hamburgers together soon because we move to Florida on July third." Give people fair warning. They care. Say thank you. I've found that you'll experience a more complete sense of closure if you offer a few sincere "thanks" on the way out the door. Thank your neighbor for being a good one, your child's teacher for a smooth year, your dentist for fitting you in when you had that terrible tooth ache, the waiter at your regular Saturday breakfast spot for keeping your coffee cup full or the teenager down the road for driving through the neigborhood more slowly these past few weeks. Don't just leave; leave a little gratitude behind you. Seriously, tell your church goodbye. At whatever point you connected with a local church, that's where you also need to say your farewells. Obviously if you joined a small group or a choir you'll want to say goodbye to those folks. But even if you never really connected with anything except that third pew from the back in the far left row...well at least say goodbye to the folks in the second and fourth pews from the back, the ones you worshiped alongside week after week. And I bet, from personal experience, that your pastor would appreciate you telling him so long, too. Almost every month my husband has a soldier appear from some far pew in the back of our church to tell him that she or he enjoyed the three or nine or twelve weeks they attended our worship services. Even if my husband never remembers seeing the man or woman before, he's always honored and humbled when the soldier stops to say goodbye on the way out the door for the final time. Goodbyes can be hard. But they're important. They provide closure. They separate us from the whales! And they show honor and respect to those you're leaving behind. And trust me, people value your parting sentiments more than you think. Are you moving? Say goodbye. To someone. Are you moving this summer? What stresses you most about moving? What's hard and what's grand about it all? I'd love to know.